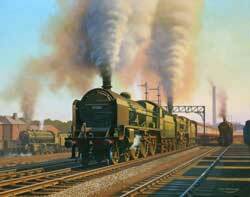 Skipton was a busy railway centre during the 1950's with a wide variety of motive power from both the ex L.M.S. and L.N.E.R. regions. No 45506 The Royal Pioneer Corps. along with sister Patriot depart with a northbound express.